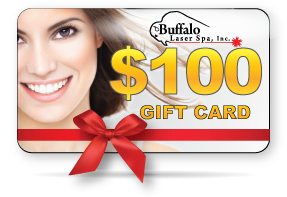 Buffalo Laser Spa & Cheryl’s Hair Removal Center is Proud To Introduce the Addition of Gentle Skin Tightening for skin tightening, body contouring, body gentle skin tightening, facial lines & wrinkle reduction, reduce cellulite, and increase skin tightening, and improve stretch marks into their laser spa. The Body Gentle Skin Tightening system is one of the most advanced procedures used to deliver deep heating with radio-frequency and pulsed electromagnetic fields, which has been proven to tighten skin and reduce cellulite. It is rated as one of the most popular anti-aging treatments of cosmetic surgeons and Hollywood celebrities as it has minimal downtime, no pain, and it gives instant results and lift. There is increased demand for this safe, proven treatment for improving appearance by firming, tightening and reshaping the face and body’s contours.Buffalo Laser Spa is offering this treatment in Williamsville, NY, Amherst, NY and the surrounding Buffalo, NY area..
Our system is FDA Approved and is the state of the art in non-invasive, pain-free cosmetic enhancement that is safe to use on the face and body. Gentle Skin Tightening demonstrates visibly firmer and tighter youthful skin, in many cases, after the initial treatment. Patients compare treatment to a hot stone massage. WHY HAVE BODY GENTLE SKIN TIGHTENING? Have you noticed that as people are aging these days, they are looking younger? In fact, as people are advancing in age, their appearance seems to be aging in the opposite direction. More people who are using the Body Gentle Skin Tightening anti-aging treatment are discovering noticeable results as soon as their first treatment or series of treatments, depending on the amount of improvement desired. Did you recently go on a diet and lose weight? Now you have excessive skin in your stomach and love handles? We may be able to help you tighten that skin. The best solution is to treat the skin as you diet so you do not get that excessive skin. Many celebrities are receiving Gentle Skin Tightening treatments powered by Concepts because their appearance is their stock in trade. There is an increasing number of people who are aging youthfully as they are experiencing the advantage of firmer skin, a softening of wrinkles and a more contoured figure. With our exclusive Body Gentle Skin Tightening system, there is no recovery time needed before reappearing in public. There is no reddening of the skin or peeling afterward, thus there is no downtime! Gentle Skin Tightening uses a multi-polar radio frequency technology combined with pulsed electromagnetic fields to penetrate the multiple layers of skin and fat to stimulate collagen production, improving skin tightening and texture/tone. As people age, it is the reduction of collagen in our body tissue that causes an uneven appearance. Anyone is subject to the accumulation of cellulite that causes the unsightly dimpling of the skin. The heat generated by the Gentle Skin Tightening system works to soften and emulsify fat cells so they can drain naturally from the body through the lymphatic system. Further, the suction on the device works to break apart soft tissue adhesions that pull down on the skin creating unsightly cellulite dimpling. 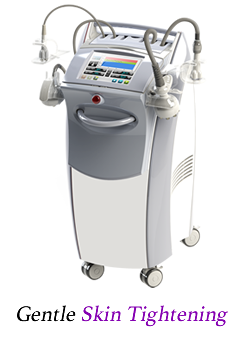 We are very excited for our newest device for Gentle Skin Tightening, anti-aging, and body contouring solutions. Patients can expect to see an immediate lift and radiant glow to their skin after just one treatment. They’ll be glad they used Gentle Skin Tightening to look 5 to 10 years younger! Call Us Today To Set Up A FREE Consultation and See How Gentle Skin Tightening Can Help YOU!